MainAll NewsMiddle EastLibyan President Apologizes for Death of Amb. Libyan President Apologizes for Death of Amb. 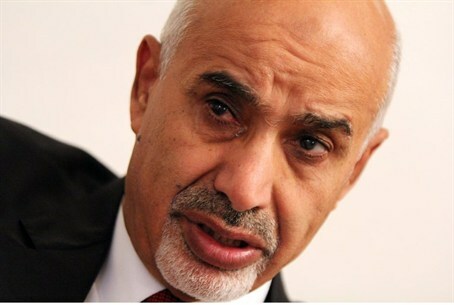 Libya’s new President, Mohamed al-Megaryef, vows his country would not be a burden to the international community. Libya’s new President, Mohamed al-Megaryef, on Monday vowed his country would not be a burden to the international community as he held his first face-to-face talks with U.S. Secretary of State Hillary Clinton, AFP reported. After voicing his condolences again for a terror attack on the U.S. mission in the eastern city of Benghazi in which four Americans were killed, Megaryef said in English, "We will not be a burden." Clinton and Megaryef were meeting in New York on the sidelines of the UN General Assembly, in the wake of more than a week of violent protests triggered by an anti-Islam film which saw tens of thousands of demonstrators take to the streets. U.S. ambassador to Libya Chris Stevens was killed in the September 11 assault on the Benghazi mission, along with three other diplomatic staff, when the compound came under sustained heavy arms fire for several hours. "I also seize this opportunity to reaffirm that what happened on 11th of September towards these U.S. citizens does not express in any way the conscience of the Libyan people, their aspirations, their hopes or their sentiments towards the American people," Megaryef told Clinton. He said the attack in Benghazi "was a very painful, huge tragedy, not only for the American people and the families of the victims, but also for the Libyan people." "The Libyan people lost a friend, lost someone who was very supportive of them, someone who was very supportive of our revolution and someone who was always there for them," he said. Clinton told the Libyan leader that she wanted to thank him for his government's efforts "to help find and bring to justice all those responsible for the attack. "I'd also like to thank the Libyan people for the outpouring of support they have shown to not only Ambassador Stevens, but on behalf of the United States," she said at the start of their talks in an upscale New York hotel. "Courage has been the defining characteristic of the Libyan people over these last two years," Clinton added. "Courage to rise up and overthrow a dictator, courage to choose the hard path of democracy, courage to stand against violence and division in the country and the world. Mr President, that kind of courage deserves our support." Intelligence sources told the U.S.-based Fox News network over the weekend that growing evidence has made it clear the attack on the U.S. consulate was coordinated between Al Qaeda and Ansar al-Shari'a terrorists.